In his book, Dey looks at the intersection of ecology, law, and agriculture in British east India, with a spotlight on tea plantations. He points out that by re-examining the legal, environmental, agricultural, and economic aspects of tea production, hidden acts of corruption and opportunism in the administrative and commercial process can be revealed—events that have led to long-term impacts on the region’s environment. 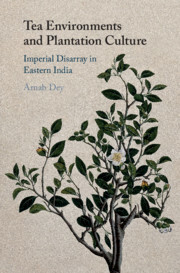 The author brings to light the influence of plant pests and diseases, forestry practices, working conditions, and politics on the history of tea plantations in the subcontinent. Providing the links between the plant and the plantation, he highlights the ironic nature of the tea economy in east India. Arnab worked on his book during his fellowship at the RCC.